Veterinarian's Assistant: I'll do all I can to help. 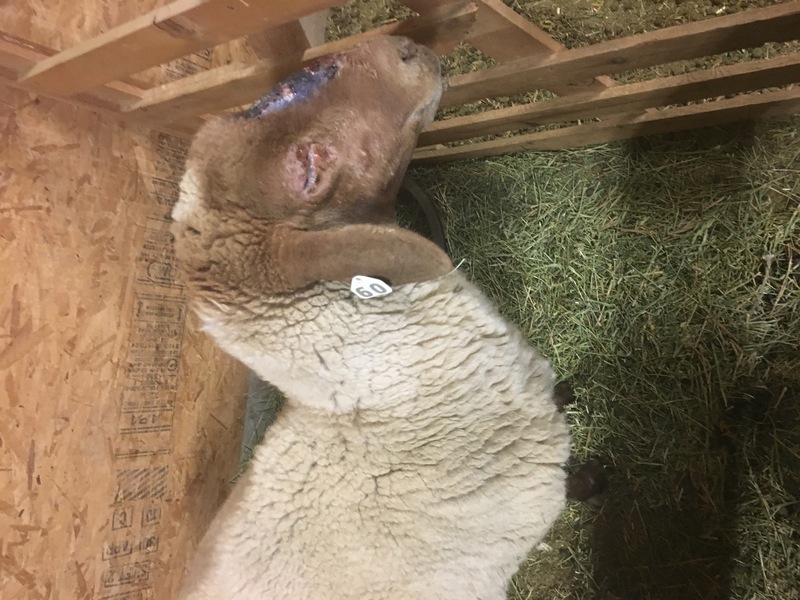 Is the ewe bleeding a lot? Veterinarian's Assistant: Phew. What is the ewe's name? This is Dr. Rein and I'd like to help you with your question about your ewe. Thanks for sending the picture along. I'll type of a reply and be right back. Thanks! From the picture it looks like she's quite uncomfortable. She can get a variety of problems associated with their nasal passages. From what I'm seeing in the photo, it looks like she would benefit from systemic antibiotics to help control infection over the wound on her nose. It will also help with controlling eye irritation. Giving her eye medications via drops, or ointment would be helpful as well. 1) Nasal bots- some ewes are especially prone to getting nasal bots during the late summer and fall. The bot larvae can wedge up into the nasal passages and cause a gross nasal discharge and pain. It's best to treat sheep that may have nasal bots with a dewormer such as Ivermectin drench or Moxidectin drench. This should take care of the nasal bot, but won't take care of the eye and skin infection over the wound. a) For wound systemic antibiotics would be most helpful. I'd choose something that is good at fighting off gram positive bacteria like a ceftiofur (Naxel, Ceftaflex). b) For eye infection I'd try and get a Terramycin ophthalmic ointment. The active ingredient is an oxytetracycline antibiotic and those often do well with Chlamydophilia associated bacteria as well as pink eye. 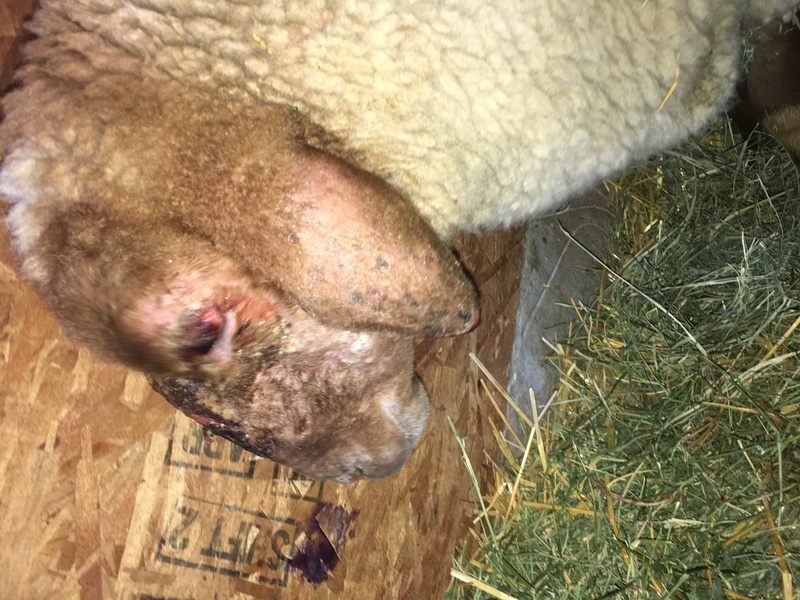 2) Allergen/Sensitivity- there may be something this sheep is exposed to that is really irritating to her and then due to the rubbing and trauma on her nose, she's spread the bacterial infection to both eyes as well. If this is the case, I'd still treat her with a systemic antibiotic, eye medications and deworm her with a dewormer that covers bot flies to make sure that situation is covered. If she's a pet, you could try giving her antihistamines in her feed like Tri-Hist granules to see if that makes a difference. 3) Older sheep are much more prone to getting a condition called Enzootic Nasal Adenocarcinoma- which is a nasal tumor of sheep. It has been associated with viral causes. I'm a little less concerned about this possibility in your sheep because if it's a condition that wouldn't go away during the winter. Most sheep if they have this condition die on average within 90 days. 4) The weight loss is most likely due to decreased appetite from her nasal infection as well as bilateral eye infection. You can supplement her with higher protein hay, like alfalfa and supplement some grain as well to try to increase her body condition. Please be aware that giving her systemic antibiotics, dewormer and eye medications will make it so that meat or milk consumed from this animal will have a specific withdrawl time depending on which antibiotics are chosen to treat the infection. You could try giving Pen G in the muscle. A 150lb ewe would get 5cc in the muscle twice per day. With thin animals, Pen G gets to be a bit much and can make them pretty sore. LA 200 would be an option if you could give it in the vein, but it causes severe muscle necrosis if given that way. You can contact your local large animal veterinarian for Naxel. Some large animal vets will even sell it by the dose, so you may not need to buy a whole bottle. Eye ointments you can get at similarly. Again, just be careful with the withdrawl times if you have any plans on selling the sheep in the near future. Especially, with the Pen G.
If I can get naxel, how much, how often and for how many days? SQ or IM? Sheep: Administer to sheep by intramuscular injection at the dosage of 0.5 to 1.0 mg ceftiofur per pound (1.1 to 2.2 mg/kg) of body weight (1-2 mL reconstituted sterile solution per 100 lbs body weight). Treatment should be repeated at 24-hour intervals for a total of three consecutive days. Additional treatments may be given on days four and five for animals which do not show a satisfactory response (not recovered) after the initial three treatments. Selection of dosage (0.5 to 1.0 mg/lb) should be based on the practitioner’s judgment of severity of disease (i.e., extent of elevated body temperature, depressed physical appearance, increased respiratory rate, coughing and/or loss of appetite). I would start at the 2ml/100lb dose. Evaluate after 3 days, but will probably have to continue for total treatment of 5 days. Treatments should be given in the muscle. Thank you so much! How often should I give the ointment?Thank you so much! How often should I give the ointment? And for how many days? A minimum of twice per day and she'll probably need to continue for 5-7 days with the ointment. And supportive care is always good in these situations, lots of fresh water, good quality hay, a little sheep approved (low copper) grain mix. If you find my answer helpful, please rate my service with the 5 star system on your screen. It really helps my approval page and is the only way we are compensated. Bonuses are welcome as well. Thank you, ***** *****! Is there anything you would recommend I put on the wound? Don't use blue coat or red coat. The best would be a silver spray like AluSpray. Thank you, Dr! Is there anything you recommend I put on her wound? You can put either the AluSpray on her wound, or if you don't have that available, human grade Triple Antibiotic cream will work as well. I gave her the ivomec drench, put on the terramycin ointment, and gave her the naxel yesterday. She seems to be more energetic, but her left ear is extremely swollen. I lanced it to see if it had pus, but only blood came out. Is this normal? Will it go down as we continue the naxel? It's hard to see from the picture where you lanced the ear. She may have developed a hematoma (pocket of blood) after shaking her ears from side to side. Ears are actually quite sensitive structures (despite how we put tags through them etc.). If you accidentally tag through an artery or lance a hematoma there can be a LOT of bleeding. I've seen ears like this in dogs who have ear infections and shake their heads all the time because their ear hurts. They eventually damage the artery in the ear and it bleeds underneath the skin causing a big lump. It's best not to open it up, at least at first because there can be a lot of bleeding and it can get infected. Because you've already opened it, treat it like an open wound. Keep the hole that you made open for drainage. She's on antibiotics systemically, so she should be covered for infection, but monitor it closely. If it accidentally gets infected she may loose the ear. I'd also check inside the ear to see if there is pus or buildup in there. A bacteria that causes ear infections in calves is Mycoplasma, and the prognosis is not good if she has this. Also, stop cutting into things!! Lol! Hematoma's will eventually shrink over several weeks if left alone and unopened. Either way, her ear will look pretty mangled after it heals. My pig has lost a lot of weight. I can see her p bones.